Provide comfort for the family of Stanley Clark with a meaningful gesture of sympathy. 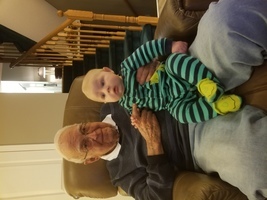 Passed away peacefully on Tuesday January 15 surrounded by his family at Stevenson Memorial Hospital at the age of 92. Beloved husband and life partner of 64 years to Leah (nee Carbery). Loving father to Kevin (Sheelagh), Kirby (Barbara), Corley (Scott) and Kent (Katune). Proud grandfather to Taylor, Alexander, Samantha, Mackenzie, Harrison, Clark and Bailey. Much loved by his honourary son Bob (Donna) and family. Predeceased by his sisters Mabel, Edith, Irene, Edna and Helen. Stan will be forever remembered by his many nieces and nephews, and life-long friends from Toronto, Alcona Beach, Alliston and around the world. A visitation will be held Monday January 21 from 6 – 9 pm at Drury Funeral Centre 519 Victoria St. E, Alliston, ON. Funeral service will be Tuesday, January 22 at 1 pm at St. Luke’s Anglican Church 508551 Hwy 89, Mulmur, ON. Immediately following the funeral service there will be a celebration of Stan's life at the Drury Funeral Centre. Donations in Stan’s memory may be made to Sick Kids Hospital or the Christian Children’s Fund. Doreen & Doug, Ruby & Dave, Kathy and Families. sent flowers to the family of Stanley William James Clark. Leah, my deepest sympathy to you and your family Stanley was a great person.